Shiva has four arms and three eyes. The third eye, in the center of his forehead is forever closed and simply opens to destroy an evil doer. A garland of skulls, rudraksha bead, or a snake hangs from his neck. 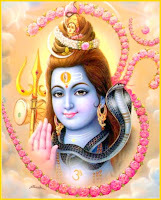 Lord Shiva also carries snakes as armlets and bracelets. The serpent, contest, despised and fear by all further creatures, establish a place of honour on Shiva’s holy being, just because he was enthused by their plight.